In the event that two devices need access to a common server, but they cannot communicate with each other, which security feature should be configured to mitigate attacks between these devices? Which statement best summarizes how DHCP snooping works? it has a matching request in the DSRT. the destination port sent a DHCP request in the last 5 seconds. the destination port specifically sent a DHCP request. D. DHCP snooping determines which switch ports are trusted and can source all DHCP messages. Refer to the exhibit. 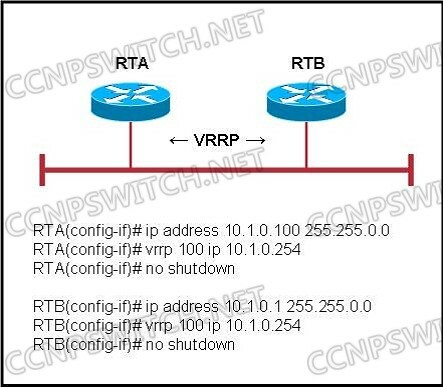 Based on the minimal VRRP configuration, which VRRP command issued on RTA will ensure that RTA is the master virtual router? Which method enables GLBP to forward traffic from a LAN segment via multiple routers simultaneously? A. Clients need to have different default gateway IP addresses coded. B. Separate GLBP groups are coded on the routers. C. The AVG assigns different virtual MAC addresses. D. Multiple AVG designated routers respond to ARP requests. E. Proxy ARP allows multiple routers to respond to ARP requests from clients.